Good news for freshers who are waiting for the Mindtree Off Campus 2018. Mindtree focuses on recruiting fresher graduates and postgraduates across India through Mindtree off campus and pool campus drives. 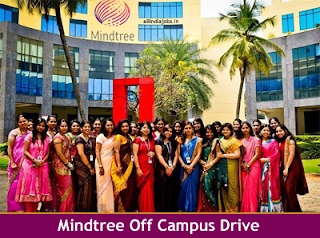 MindTree company will conduct off-campus drives in various places like Chennai, Hyderabad, Bangalore, Mumbai, Coimbatore, Pune, Kolkata, Noida, Gurgaon and in some other places. This post is made for the candidates and it will definitely help you in finding the eligibility criteria, registration, selection procedure, and other important information about Mindtree off campus drive. Interested and eligible candidates can apply online for Mindtree off campus drive through below provided registration link. Mindtree conducts off campus drive to hire capable and talented persons. At present, so many IT Industries are seeking for highly talented engineering graduates and postgraduates willing to participate in the development of next-generation technologies. Like previous years, this year also Mindtree is going to recruitment a vast number of freshers through college off campus drives. We have also gathered latest Mindtree Interview Questions and Mindtree Test Pattern for better preparation. Scroll down to see the more information before attending the interview. If contenders have any doubt regarding Mindtree Off Campus Drive 2018 can contact us through email. Keep visiting our site All India Jobs for latest job updates. BE / B.Tech / ME / M.Tech: Computer Science / Electronics Engineering / Electronics & Telecommunication / Electronics & Communication / Information Science / Information Technology. Candidates should have 60% and above in academics in 10th, 12th and graduation (aggregate of 8 semesters in graduation). Candidates who have already appeared for Mindtree Off Campus recruitment process in past 6 months are not eligible to attend. The participants should have scored an aggregate of 60% & above in all academic courses from SSC Onwards. Candidates who are interested in working with Mindtree shouldn’t have any standing backlogs. It is mandatory to each and every candidate to clear backlogs at the time of appearing for Mindtree off campus interview Process. Mindtree will provide salary based on their performance shown during the Interview Process. Who will select in Mindtree Off Campus Drive as a fresher can expect the wage in between Rs 3 LPA to Rs 3.20 LPA. Mark sheets of 10th, 12th and under graduation course. Original and a photocopy of any of the following valid Photo proofs – College ID card, Driving License, Passport, Voter’s ID Card, Aadhaar Card. Have a look on Mindtree Test Pattern and refer it before going to interview. We hope the context about Mindtree Off Campus Drive 2018 is helpful for the contenders. Wishing you All the best for a better career from All India Jobs Team. For more latest job updates contenders can visit our site frequently and bookmark this page www.allindiajobs.in. For how long will the off campus drive for Mindtree will be open ? What is the last date to apply for mindtree drive?